Gold, gold, and more gold! Seems like some rivers don’t run out of it. They keep washing downstream and sometimes you’re lucky to find them, sometimes you’re not. All of this is a part of that excitement in finding gold. If you’ve already caught some of that gold fever for some time now, you’re probably thinking of how to catch more gold. Typically, gold panning is the most usual way of finding gold in rivers and streams. However, settling for gold panning might yield low amounts of gold for so much of the time you have spent. For gold prospectors who want to raise the bar, especially for those who are starting to consider finding gold as a serious hobby, the tools of the trade have to go beyond the old shovel and pan. Now there are many ways of increasing the amount of gold you find by using different tools and machines. A sluice box is one of the oldest simple machines used by gold prospectors. It is a “separator device” that breaks layers of river sediments until gold is separated from all other materials. The box is non-moving and simply uses gravity and the flow of water. As water moves through the sluice box, rocks, small, objects, sand, and gold get trapped in different layers called riffles. The device works more effectively when compared to gold panning as the act of separation is done by a machine and not by hand. However, for it to work effectively, you should have the correct configurations and materials in building one. Of course, people can get creative with these things and come up with various takes on the sluice box. Some have curved shapes while others are taller than usual to work in deeper parts of a river. These differences happen based on the environment where you are prospecting for gold. Choose if you want to build a sluice box from wood, aluminum, steel, or plastic. Start creating the frame of your sluice box. ​If you are using wood, make sure you apply silicone to the edges to prevent water leakage. ​Lay down the ribbed mat as you first layer in the sluice. Extend it to the bottom tip of the flare but leave ¼ of the bottom part of the sluice empty. ​Lay down the second layer, which is the miner’s moss. This should be slightly shorter than the ribbed mat and placed at the center of the ribbed mat. ​Lay down the third layer on top of the moss, which is the metal mesh. It has the same length of the miner’s moss. ​The bottom could be used for the rain gutter as riffles in catching gold. 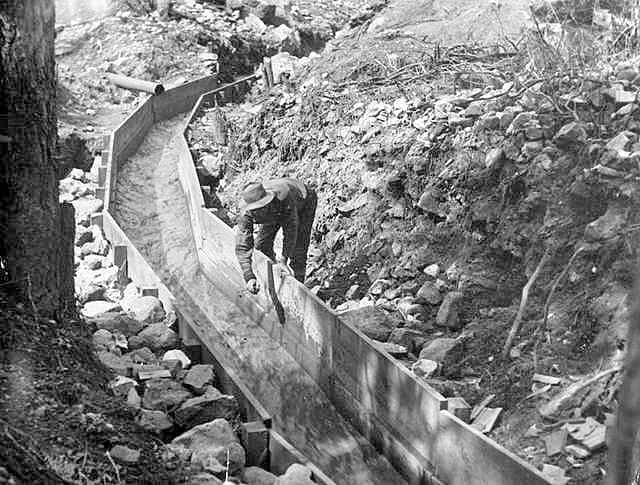 Or, attach l brackets (or riffles) to the sluice to sandwich together the layers of ribbed mat, miner’s moss, and metal mesh. Attach a PVC-based spray bar at the flare to initiate water flow during testing. Test to see if it is able to separate sediments. Using a sluice box is not so difficult. If you are able to build a sturdy sluice, it’s time to check it out on the river or creek. Place your sluice box at a shallow part of the river. Do not submerge the device as you might lose the point of separating sediments and eventually, the gold as well. Check if the sediments are well separated by the device. The miner’s moss and metal mesh should be good enough to capture the small particles of gold. The l brackets or riffles should be able to capture larger pieces of gold. Adjust accordingly if the gold does not seem to fall in place or if the sediments are not separated well. 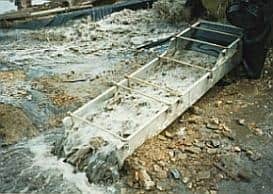 If you’re able to follow the correct configuration on how to build a sluice box and use it well, finding gold along rivers would prove to be an easier task. It saves you time from sifting gold in a pan and it does not require electricity to operate. Aside from that, it also makes gold hunting more fun!